Have you ever heard expression “garbage in, garbage out”? No doubt, if we do not put correct data into any perfect software system, we won’t get correct data out. Period. The more accurate master information is in the system, the better supply chain procurements execute and as a result the better business performance and our customers are happier. Everybody wins. The opposite is also true, poor incomplete data leads to poor planning and execution, lack of credibility. The question arises: how on earth, in today’s rapidly changing and turbulent business environment, where everything can change overnight, we can maintain high degree of data accuracy for thousands and thousands of ERP database records? Is there a way to keep up with high standards to withstand economic storms? Use of traditional QAD user interface does not allow high level of efficiency. 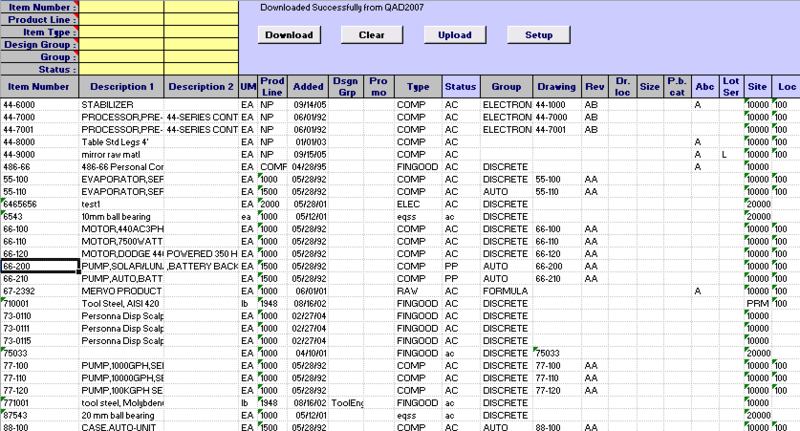 QAD maintenance programs are designed to view and update one record at a time. To revise a thousand Item Master records, one has to pull 1000 individual records one at a time and update each one. It is time consuming, but OK if you do it once in a while. This was not a problem a few years ago, but today it is a different ball game. It must to be done quite often and most important, very fast. But, how? The recent economy slowdown companies had to downsize their staff, which caused even more workload to the remaining personnel. What if the changed value is incorrect? When user clicks on “Upload”, the program scans the entire spreadsheet and validates the whole dataset against genuine QAD logic, so if you would key in all of it manually to QAD maintenance program. All erroneous values are immediately highlighted, as shown here, and detailed messages are provided. Upload is not performed in this case. This gives user an ability to quickly find and fix errors, unlike in traditional CIM load solutions, where it’s close to impossible to find where error is coming from. Here, end users can perform their job quickly, accurately without IT department to be involved. Unlike in QAD maintenance programs, here, minimum to none training is required, very fast adoption – temp workers would be able to help. The excel tools we have developed, will boost your productivity, immediately. We have many acknowledgements from our customers. However the most important thing is that these solutions can give you a pleasant feeling of accomplishment, when you complete a lot with a tiny effort. Your PC does the hard part for you – as it’s supposed to in the first place. Will it work for you? Some of our clients reduce the number of staff because of our programs, some others eliminate overtime. We have a few dozens of success stories in all kinds of industries, but will it work for you? The bottom line, you never know until you try it, right? Then contact us today to get a free trail. You have nothing to lose and everything to gain.